Posted by ayasawada in Gunpla. Some kits sit around for ages before you actually get around to making them. I got this one about three years ago, when my sister went on a trip to Japan. I’d actually wanted it mainly for the free promo DVD that came bundled with it. She came back with a heavily discounted box — marked down because it was sans DVD. Let this be a lesson kids, be honest why you want something when you ask people to buy things for you. 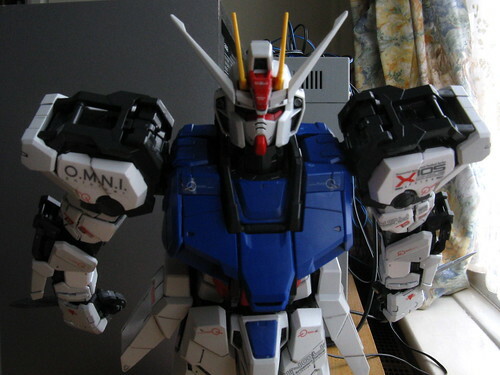 Thankfully I like the Gundam itself too — who wouldn’t love a black version of Strike Gundam with added weaponry? 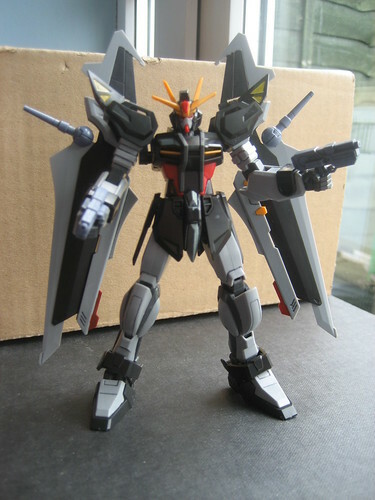 The Strike Noir is the main mecha from the Gundam SEED: Stargazer OVA anime, a spin-off of Gundam SEED Destiny with little to do with the main show. That actually worked in its favour given the stinking pile of crap Destiny turned out to be. For a three episode series lasting a grand total of 45 minutes, it was pretty good and I loved the ‘upgrades’ of the original SEED Gundams. This is the first 1/144 kit I’ve made in a while, and probably the last I’ll do, since I’ve vowed to invest only in the better quality MG and PG kits. To be fair, Bandai’s gotten pretty good with it’s HG 1/144 line these days. With HG, a 1/144 scale figure no longer looks as cheap and nasty as the no-grade versions. While a splash of painting helps, there is nowhere near as much as used to be required and a quick and dirty job using just the stickers would yield a decent looking model. Finished up my 1/60 PG Strike model kit this weekend. It’s the first gunpla kit I’ve done in over a year. I struggled to find time last year due to moving, work, real life etc. Somehow it always seemed like there was something else I should be doing with my time instead. As such, all my leftover kits (and the MG Infinite Justice I got for Xmas) were left back at my parents place. But I try and do a bit every time I go back home to visit the folks. As such, this one — already a huge undertaking — took longer than if I’d spent every weekend on it.